QuickCall.com is a managed brand of SRVR, LLC. "Our company was built by and for immigrants," said Dana Todd, chief marketing officer. "The way people connect with friends and family in other countries has changed." QuickCall.com, a managed brand SRVR, LLC, is a finalist in the Multicultural Media App category. QuickCall.com serves the needs of people with international friends and families, utilizing its international calling network to provide a social and business calling solution. 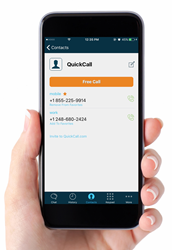 QuickCall.com is especially valuable for the millions of people in the U.S. and Canada who face challenges when making calls to their home countries because of technology restrictions or when free Wi-Fi calling is not available. The app also provides free chat, calls and messages to others using the app, in-app payments, app sharing and account management. "Our company was built by and for immigrants," said Dana Todd, chief marketing officer. "The way people connect with friends and family in other countries has changed, and we built our app to reflect the growing demand for chat, free calls and global travel use. There's also a people component to our app - it's backed with customer service in 18 languages, which further represents our commitment to ethnic market needs." The Appy Awards, hosted by MediaPost Communications, will be presented on May 17th at the Radisson Martinique in New York City. The Appy Awards recognizes the best of the best apps in 39 categories. SRVR partners with some of the most recognizable names in international telecommunication, including QuickCall.com. Our managed brands provide customers with reliable ways to call, chat, video conference and manage their communications needs. By providing technological solutions to real world problems, we help keep people connected to the people and places that matter. MediaPost is an integrated publishing and content company whose mission is to provide a complete array of resources for media, marketing and advertising professionals. MediaPost is the holding company for the following entities: MediaPost.com, 30+ industry conferences and events each year nationwide and in Europe, including the OMMA, Insider Summit, Marketing and Engage conference series, seven annual award shows, and a suite of 50+ industry-focused email newsletters & blogs.